Please refer to our stock # T 1743 when inquiring. All metal is sterling silver and Made in USA. Only one. Designed and hand hammered in a USA studio by one set of hands. Two sided square cufflinks / cuff links designed, cut, hand wrought, fabricated by and signed by the studio metal work artist as: Handmade - Sterling - Mimi Dee. 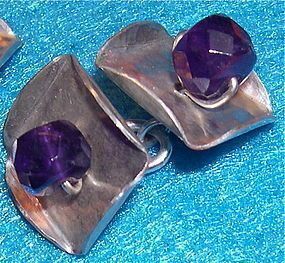 9/16" square with an 8mm X 5mm faceted rich plum genuine amethyst on each side - just over 5 carats TW. Gems mined outside of the US. Legal: All images design concept content text solely owned by Mimi Dee. Make this a super special collectible when you commission a hand painted signed presentation box! $10 USPS Priority/Ins/Track or Free with USA Ck or USPS MO. This signed studio metalwork jewelry artist who also paints oils and has made fiber art to wear garments in the past, has exhibited in various juried artist shows, more recently since 1990 to present.